Americans who have seen friends and family suffer economic devastation due to job loss or illness are finally realizing that it could happen to them. As a result, we’re making major changes – including cutting non-essential purchases and making regular deposits to savings accounts. In the past few months, we’ve begun paying down debt and putting money aside for a rainy day. In a recent poll, Visa asked more than 1,000 people about their savings intentions and learned that 30 percent are actively saving for a rainy day. Others are saving for retirement (20%), for education (10%) or to purchase a home (8%). While some of these figures may overlap, that indicates that over half of us are now actively saving. At the same time, some are simply bailing out, opting to take Bankruptcy to get a fresh start. Bankruptcy rates increased by a third from 2007 to 2008 – with 1.06 million consumers filing in 2008. 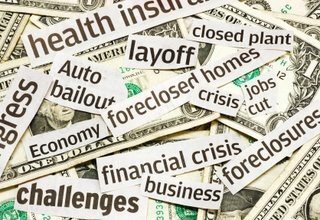 The most common reasons given for the decision to take bankruptcy are job loss, divorce, unexpected expenses, and significantly overextended credit. For many, there’s no ladder tall enough to help them see over the top. Some have ended up in this position as a direct result of the risky mortgages they were sold. When the rates adjusted, they were unable to make the payments, so began drawing money from credit cards while putting those houses up for sale. They hoped to get out from under with their credit still intact. Unfortunately, prices began dropping at the same time, so many found that their homes were no longer worth the balance due. Some attempted short sales – but often it was too little, too late. New plans in place will hope to streamline the process, but until now it could take 8-10 weeks to get approval for a short sale – during which time the foreclosure would have been final or the buyer gone. 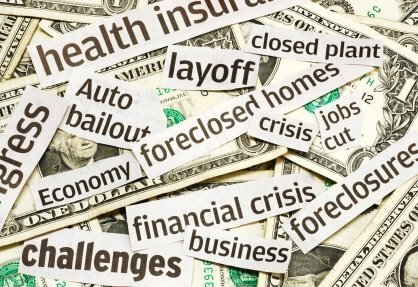 • Chapter 7, which completely removes all unsecured debt and keeps secured debt. • Chapter 13, which is a reorganization plan for people with little unsecured debt. Under this plan, participants agree to a repayment plan over 3 to 5 years. The good news for those filing bankruptcy who want to keep their homes is that Judges will now be able to reduce the balance due – bringing it down to the fair market value of the home. This entry was posted on Thursday, January 15th, 2009 at 9:23 am	and is filed under economics. You can follow any responses to this entry through the RSS 2.0 feed. Both comments and pings are currently closed.